Brazil’s election of far-right candidate Jair Bolsonaro – a controversial retired military officer who has been dubbed the ‘Trump of the Tropics’ – as its new president has rattled the country’s science community. There are fears that science funding in Brazil will dry up, along with academic freedom, after Bolsonaro assumes the presidency on 1 January 2019. 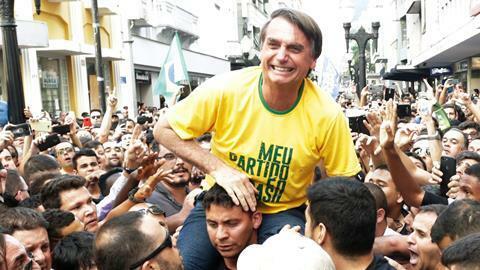 It was a relatively tight election, with Bolsonaro winning 55% of the vote. He beat out Fernando Haddad, a professor at the University of São Paulo and former minister of education. Haddad is credited with growing investments in the Brazil’s public universities and had proposed to increase spending on science. Researchers note that government funding for science and technology has fallen dramatically in the last few years. The proposed budget for 2019 maintains the current level of support of about BRL3 billion (£600 million), which is around 45% down on funding in 2017, which was about 25% less than in 2016. A year ago 23 Nobel laureates wrote to former President Michel Temer warning about the state of Brazilian science and of a ‘brain drain’ that was underway. The science ministry is responsible for funding much of the research that comes out of public universities. As a result, the country’s researchers wonder whether that money, however paltry, will continue to flow if the science ministry is shuttered or subject to significant cuts. In any case, many scientists worry that Bolsonaro’s campaign rhetoric and record show that science and technology will not be a priority. ‘My fear is that he will pretend to think about science, while making it more for defence purposes with funding primarily for military institutes,’ says Tatiana Roque, a professor of mathematics at the Federal University of Rio de Janeiro. In that case, this money would not be connected with universities, and it would likely go towards applied defence research rather than basic science, she says. Adding to the sense of doom are apparent invasions in recent weeks by pro-Bolsanaro police on university campuses to clamp down on anti-fascism protests. There is so much fear of retribution that most scientists in the country won’t comment publicly or express their concerns on the record. In the run up to the 28 October election, the federal police and the Brazilian agency that regulates elections descended on 17 universities. In response to human rights protests by student unions, officials seized materials from students, as well as professors. In another recent incident a senior official at a university in southern Brazil put up a banner in front of the law school expressing support for freedom of speech. The federal police threatened to throw him in jail. He quickly took down the sign. ‘This says a lot about what we can expect with regard to academic freedom – it will not persist under the Bolsonaro administration,’ Artaxo tells Chemistry World. Other researchers in the country agree that such activities send a strong message that electoral authorities are already working with the federal police and the incoming Bolsonaro administration to suppress academic freedom. I think the biased comments on other countries political developments have no place in Chemistry World. First, the police today obeys a president of PDMB which is center left, far from Bolsonaro's. Second it is possible for the Ministry of Science to be eliminated which will leave Brazil in the same situation than UK or USA. Next, according to poolers 79% of Bolsonaro's voters were more educated citizens from the richer south while 89% of the opposition votes come from poor, less educated North. Why is that? Because they reject highly corrupt left and center left politicians.